The Vaults, a new €5m visitor attraction has opened in Dublin’s Liberties, creating 50 jobs and becoming one of the biggest employers of full-time performing artists in Ireland. 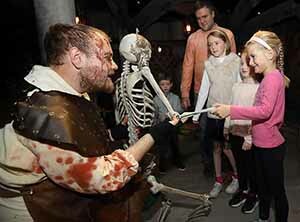 Vaults Live is a live theatrical visitor attraction in which six scenes from Irish history are re-enacted. They include a Cromwellian torture chamber, the crypt of a Dublin church, a Viking settlement, Bandon courtroom, medieval apothecary and what was once Europe’s biggest red light district – Monto, in the heart of Dublin city. Characters include Dracula author Bram Stoker, Viking Ikea, Judge Dolores Fitzroy and Molly Malone. Vaults Live can accommodate 35 people per show. There are up to 30 shows a day, seven days a week. The scripts for each scene were first written by comic writer, the late Fergus Linehan. Award-winning playwright Peter Sheridan created the final versions. “The aim of the Vaults stories is to make every guest laugh and, maybe, scream and to send them away with an unforgettable insight into why we, the Irish, are the way we are,” says Sheridan. Vaults Live has been developed by Frontier Entertainment, which is driven by former broadcaster Paul Blanchfield and producer Gerald Heffernan, who was responsible for RTE travel programme No Frontiers. The project is backed by the Belfast-based Lagan family who invested €3m into Frontier Entertainment earlier this year. Vaults Live is housed in the redbrick Augustinian St John’s National School, located in the John’s Lane area of Thomas Street. It can accommodate 35 people per show and is open seven days a week. The Parlour café and giftshop was designed by Roisin Lafferty and the team at Kingston Lafferty Design. Vaults Live is located on the Dubline, a cultural and heritage walking trail running across the city from College Green to Kilmainham. Director Conor Hanratty was involved in the process of casting and directing the Vaults Live production. Conor is now honouring commitments in Atlanta directing West Side Story, but continues to be involved in the project. Director Megan Riordan is bringing the production live. “One of the ways live performance is competing with Netflix is in this move towards immersive, immediate performances that bring you to the very heart of the action. The Vaults is a live experience like no other. Gerald Heffernan says the show consists of thrilling special effects, moments of pure fun, lots of audience participation and dark humour. We have put together a company of actors to create a stunning walk-through journey of real and imagined events in Irish history and we present them with a twist. It’s exciting, fun and there might even be the occasional scare.